it is that time of year again where i get my self tan on. for those of you who know me, you know i am a self tanning addict. once self tanner season rolls around, you can catch me tanning anywhere from 2-4 times a week. i don't like to sun tan (wrinkles, beware), but like to be bronzed, and self tanner is the perfect solution. last year i did a Grail or Fail review of self tanners (read here) and thought i would give my self tanner review a little update. 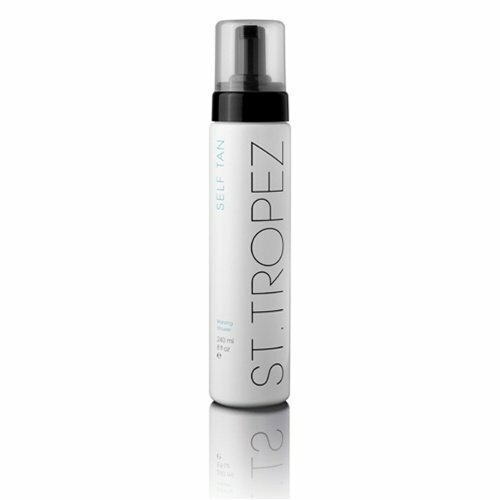 on my scale of self tanner Grail or Fail, St. Tropez is the ultimate Grail. i have yet to find a product that i like more than the St. Tropez mousse bronzer. it is immediate tan (as in brown, not orange), doesn't streak, applies evenly, dries quickly, well scented, and lasts forever. i'm finally finishing up my bottle i bought last spring. i would say that was $40 well spent. did i mention already that i'm addicted to self tanner? 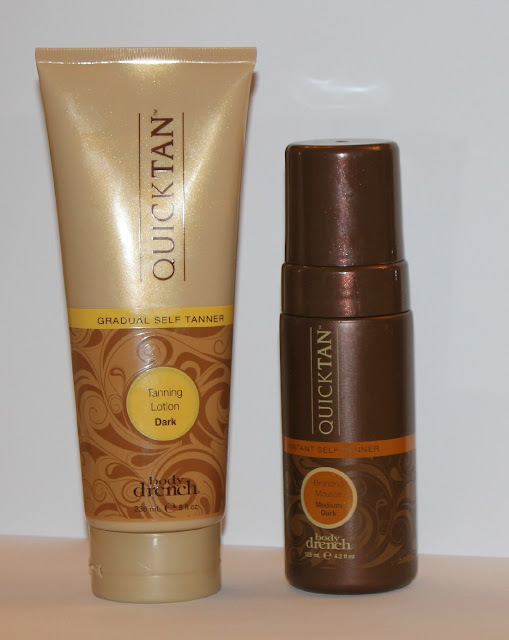 i received these QUICKTAN products to try by Body Drench. i hadn't used these products before so thought i'd give'em a whirl and share my thoughts with you. the Gradual Self Tanner is pretty impressive. it eliminates the limfacs (that's Air Force speak for limiting factors) like: did i exfoliate enough? did i moisturize enough? did i spread too thick? did i spread too thin? is it streaky? etc. instead, you simply apply like a typical lotion and within a few days your body has a nice "glow" to it. you aren't left with orange hands or missed spots. it is sort of like Self Tanning For Dummies. not my Holy Grail of products, but definitely worthwhile if you are a bit timid in the self tanning department. maybe you've been burned (or in this case, oranged) too many times and are scared to give it another shot, QUICKTAN Gradual Self Tanner is a good place to start. the QUICKTAN Instant Self Tanner is a decent product, but i wasn't blown away by its capabilities. for those if you in the market for instant tan, i would still recommend St. Tropez. Does the St. Tropez have that self-tanner smell? That's my biggest concern in a self tanner. that is one of the things i love most about this product. doesn't leave you quite so smelly. there is a very SLIGHT scent, but i have yet to find a product with no scent at all. St. Tropez is definitely the best scented i have found. Have you ever tried TanTowels? I first got it a few years back through HSN dot com, but they also have it at Dillard's, Nordstrom, etc. It was the BEST self tanning product I'd ever experienced. So maybe you could give that product a whirl! It'd be awesome. It comes in different packs & different size towels. There are some exfoliating towels, extender towels, small, half-body towels, large towels, etc. I'm a lover of self tanner. Well, the rare self tanner that works! High-five! I am white as a ghost...I need this! Is the mousse better than the lotion? Where is the cheapest to order it?